And how about the clowns who deliver all occasion balloons? They still deliver in my city…I love them! I have always had a fondness for clowns and am fortunate enough to own 2 Red Skelton prints which I cherish. Bring in the clowns! Yes, Hubsey and I both remember seeing those paintings years ago and loved them. Thanks for your comments clown-lover. Well good for you for remembering the ‘Red Skeleton’ kind of good clown. Unfortunately, once the Hollywood freak show turned them into frightening killing machines we kind of forgot the good ones, too busy looking over our shoulders for the ones coming after us. I agree with you and Janice, bring back the good image! Maybe you can start a ‘save the clown image’ online petition! I’ll sign. Thanks Blanche…I appreciate the first signature on our way to clown-freedom. So happy you have good clown memories too. Your title says it. 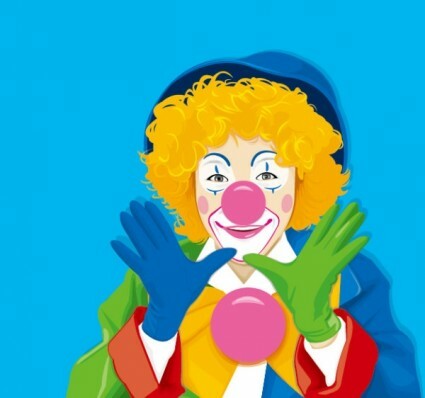 Who would ever interpret the phrase “clowning around” to mean murdering or mutilating someone? I love clowns. Always have always will. Another clown-lover! How great is that? Thanks Rump! My favourite clown was Red Skeleton! And didn’t Lucille Ball do a clown routine too? Love children’s Birthday Party clowns too…..I wonder if kids do that anymore? Parties have gotten so expensive and elaborate. Keep the scary ones away from me….they give me nightmares! Thanks Britt Girl…Red Skelton seems to be a favorite among clown lovers. Yes, I think they still do children’s parties, but with whole families growing up hating clowns, they can’t be as popular as they once were. Sadly the evil clowns have prevailed. Fabulous Pat â you are amazing. Giller prize next. Thanks Macbeth…nice to hear from you. Glad you enjoyed it. I love this! Send in the clowns huh! Right into my nightmares to only schedule their jack-in-the-box leap from my closet. I love that you love them, however between their makeup, hair and hidden weapon they are the devil’s trifecta of a practical joke for me! Great post and when Chucky comes knocking I’ll send him on down to your place. Hey sweetmama…welcome to my blog! I was wondering when the other side would weigh in. I don’t know about Chucky…but Chuckles is welcome to sleep in my closet anytime. Thanks for your comment. Thank you for your comment. I can see you enjoy the study of many things, including clowns and their luggage. Oh, Pat, what a delightful post this is. I grew up with the same clowns you did and remembering their antics still makes me smile. I have a clown mask I wore as a child to top of a clown outfit my mom made me for Halloween, my favorite costume ever. It hangs on a guest bedroom wall. My grandchildren won’t sleep in that room unless I remove the mask and hide it away in another room. How sad. I wish I could help them come into the light of good clowns. Even Barbara Streisand & Judy Collins like clowns! Smart women! Poor clowns are getting such a bad rap from the younger generation. Plus it’s a tough job! My singing partner, Craig, did a considerable stint of time donning the orange wig and funny hat. At one performance a kid kept yelling, “You haven’t been funny yet, I’m not laughing!” I felt so sorry for Craig. Just putting on the outfit is an act of courage. It most certainly is! Always easier to sit back and be a critic than put yourself out there. Good for Craig! Thanks for reading Adrian.